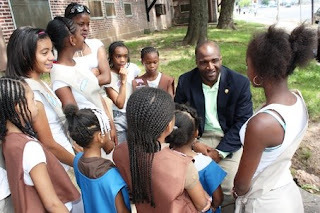 In the South Ward of Newark NJ, Councilman Oscar S. James II has proven to be passionate about issues concerning urban youth and education by launching a recruitment drive on behalf of the Girl Scouts Heart of New Jersey. During yesterday's event, Councilman James alongside NJ Membership Segment Director Lisa Mintz, praised the forming of Troop 05219 at the Seth Boyden housing development. With other events scheduled at The Bergen Street Festival in August and the Adult Summer Basketball League during July and August, the Councilman is certainly fulfilling a needed role in the advancement of Girl Scouting. Read more about his efforts here. Do you have examples of outstanding adult participation in your community? If so, please share!